We're still several decades away from developing completely immersive computer simulations, but it's not too early to dream about the ways we'll be able to use them. Today we're exploring the tremendous potential with new gadgets like Glass, Google's computer glasses. But that's just the beginning. So, in preparation, given all the different options soon to be available, what kind of virtual reality experience will you choose? Will it be a partial soft simulation? Or perhaps you would prefer an active communal experience? Confused? No worries, we'll go over all your options. And in the end, you may even find that you'll want to mix and match. Indeed, when considering the all the different possibilities that could come about through the advent of advanced simulation technologies, it becomes obvious fairly quickly that there will be a wide number of interactive possibilities. Thankfully, a number of futurists have made an attempt to predict what we can expect — and how we may wish to spend our time in environments far removed from our own. How will you plug in? The first thing you'll need to decide is how you're going to enter your AR or VR world. If you're looking for something a bit less invasive, and are uncomfortable about being completely immersed in a virtual environment, then you should definitely look into augmented reality. Already today you have such options as AR apps on your mobile device, and soon you'll be able to choose various overlays for your Google Glasses. In future, AR engagements could be facilitated by tiny wearables, advanced contact lenses, or by implants. Of course, a limitation of AR its that it combines real-world environments with virtual graphic overlays, so if you're looking for something a bit more immersive, AR may not be for you. Instead, you may wish to consider holographically-enabled simulations. A prime example is the Holodeck of Star Trek's Next Generation series, or the VR pods of Minority Report. Once developed, you'll be able to simply walk into the device and start interacting with a holographic environment projected just for you. Now, while visually compelling, a major drawback for this kind of simulation is the complete lack of tactile engagement (unless you're equipped with full-body haptic suits). You won't be able to touch anything virtual, and you may have to suspend your disbelief from time-to-time to make it seem real. Looking further ahead, however, a more advanced option would be the proverbial "brain jack" — the kind of brain-computer interface portrayed in The Matrix. This rather invasive device would transmit brain signals into the various neural cortices of your brain (visual, auditory, etc.). For all intents and purposes you are somewhere else, even though your body remains in the real world. Another option, given the development of advanced nanotechnology, would see the replacement of a physical brain jack with brain-infused nanobots. In an idea proposed by the futurist Ray Kurzweil, these microscopic robots would essentially serve the same function of a brain jack, feeding sensory signals into the sensory inputs of your brain to give you the impression of being in a different environment. These last four examples are all what are called "hard" simulations — a term used by the technologist Barry Dainton to describe various simulations types. Hard simulations imply that you still have a body, even though your subjectivity is being directly manipulated. But if you're willing to go the distance and discard your body altogether, then "soft" simulations may be what you're looking for. This would require you to upload your mind into a supercomputer, where you'd live out your days in a simulated environment. But just remember, your consciousness would essentially be generated by the computer running the appropriate software — you will have absolutely no external hardware support. Something to think about. The Agents of The Matrix are a good example of a soft simulation, as is the uploaded character Kevin Flynn in Tron. They have absolutely no physical presence outside of the simulation and are completely self-contained, both in terms of their psychologies and their environmental experience. Now, just because you've decided on the method of simulation doesn't mean you're done. You'll also need to decide on the very nature of your individual experience. Will that be a complete experience, or partial? An important consideration is whether you'd like a "complete" or "partial" experience. In a complete virtual reality experience, every single aspect of your subjective experience is generated by the computer. A partial VR, on the other hand, allows you to retain all or most of your original psychology. So, in a complete simulation, you could have your original psychology completely suppressed and transplanted by a new one. Essentially, you wouldn't know that you're someone else outside of the simulation. In a partial simulation, you'd still be you, and you'd know you are you — and you'd still have all your memories — much like what Captain Picard experienced in the classic TNG episode, "The Inner Light". Are you an active or passive type? You'll also need to decide if you want to have free will or not. In an "active" VR you are a free agent (well, as free as any agent can be). Alternately, you could have all your actions dictated by the program (while maintaining the appearance of having free will) and take part in a "passive" experience. You would have an apparent psychology, and feel conscious, but your real "self" would be entirely suppressed or nonexistent. Consequently, all your experiences would be preprogrammed. Think of it as digitally imposed pre-determination. An individual or communal experience? Depending on just how solipsistic you want to be, you'll need to decide whether your VR experience will be communal or individual. In a communal VR, you would inhabit an environment that is shared by a number of different subjects, each with their own individual and autonomous psychological systems. Or, should you want a highly individualized experience, you could be the only "real" subject equipped with an autonomous psychology. The other "inhabitants" of the simulation would be bots, mere automatons generated by the machine. Of course, you could also combine communal and individual simulations in which "real" people are intermixed with bots. This scenario is explored in the 1999 film, The Thirteenth Floor. And all this leads to the last consideration, and that's deciding on one of any number of combinations. According to futurist Tony Fleet, there are as many as 32 different combinations (check out his tables) — but argues that only nine are viable or logically consistent. For example, in a partial simulation scenario, an external body is required — therefore this is only possible in the hard simulation case; a partial soft simulation is therefore impossible. Fleet suggests that the only viable combinations can involve the communal/active, individual/active, and individual/passive simulation types. But that said, he suspects that there are many more possibilities that can be explored, as there haven't been distinctions made between physical, virtual, and mixed VR experiences. This opens the door to some remarkable possibilities. How exactly will you use these simulations? Augmented reality opens the door to entirely new types of gaming options, including the presence of objects and markers that don't really exist in the real world. Imagine an AR scavenger hunt — or going out on a date with a simulated person. More radically, given some of the more immersive possibilities, you could take on the life of a billionaire while retaining your original psychology. Alternately, you could join the Mongol Horde — equipped with an entirely new psychology — and oblivious to who you are in the real world. Or perhaps you'd like a new set of friends, who unlike your current friends, will be programmed to appreciate you for who you really are. Finally, it's worth noting that you may actually be in a simulation right now — an autonomous agent with a replacement psychology living in a hard simulation. Should this be the case, you're about to take a step even further down the rabbit hole. Composite image above via Google, Star Trek Wikia, Gamewallpapers, dan-dare. 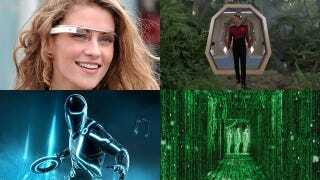 Inset images via Road to Virtual Reality, anu-movie-reviews, startrek.com, Collider.